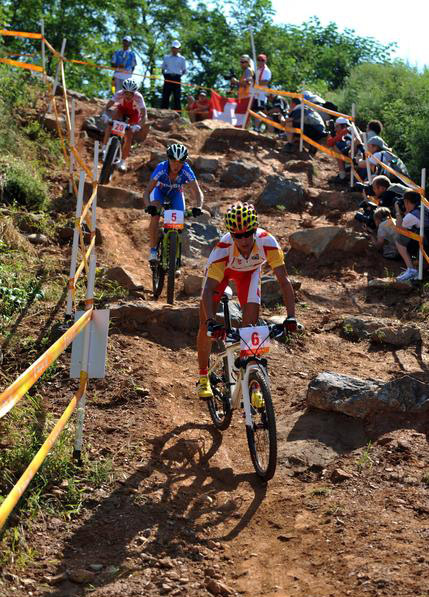 Thursday was an important day in the field of Olympic mountain biking and cycling. USA Cycling made the announcement of who will be eligible to be nominated for Team USA in the 2012 Olympic Games in both the women’s road cycling and the men’s and women’s mountain biking events. In total, there were 30 individuals selected: 13 for women’s road cycling, 9 for women’s mountain biking and 8 for men’s mountain biking. While the official qualifying process has not started, the United States is poised to send at least 4 individuals for women’s road cycling events; cyclists Robin Farina, Amber Neben, Megan Guarnier and Evelyn Stevens automatically qualified for the event. Evelyn secured her spot by winning the 2011 USA Cycling Elite Women’s Time Trial National Championship. Farina claimed her position by taking 1st at the 2011 USA Cycling Elite Women’s Road Race National Championship. Guarnier had an overall victory at the 2011 Giro Toscana, while Neben placed in the top 25 in point rankings internationally in the 2008 Beijing Olympics, earning her an automatic reentry. Nine others will be joining these four as optional selections for the final 2012 team. Much like the women’s road cycling qualifying process, there were several women in the field of mountain biking that have automatically qualified for the Olympic mountain biking team. While each biker has won specific races and mountain biking events that also qualified them for their positions, all five individuals placed within the top 50 female mountain bikers internationally and therefore qualify for the Olympic mountain biking team. The automatic qualifiers are Lea Davison, Georgia Gould, Heather Irmiger and Mary McConneloug. They will be joined by four other optional qualifiers: Willow Rockwell, Judy Freeman, Krista Park and Chloe Woodruff. There were a total of eight individuals named for the men’s Olympic mountain biking long team: five automatic qualifiers and three discretionary selections. Those to received automatic nods were Todd Wells, Jeremy Morgan-Kobelski, Jeremiah Bishop, Adam Craig and Sam Schultz. Kobelski, Bishop and Craig all received their automatic nomination by finishing inside the top 60 of the UCI individual international rankings, while Schultz finished third in overall standings in the 2011 USA Cycling Pro Cross-Country Tour. Todd Wells finished 7th at the 2011 UCI Mountain Bike World Championships and 10th in the UCI World Cup. USA Cycling has issued a statement that congratulates all of the athletes who have been nominated to the Long Teams and commends their hard work and competitive spirits. We will have to wait another two weeks before knowing the Long Team lineups for both men’s and women’s track cycling. On May 31, 2012, the Long Team for the men’s Olympic BMX will be announced. Neither the men’s road cycling or women’s BMX events have Long Teams. Qualifying for these events is projected due to results in competitions that will be held throughout the remainder of this year and into 2012. As of yet, nobody has automatically qualified for either of these events. This entry was posted in Land Sports, Mountain Biking, News and tagged Mountain Biking, Olympics, USA. Bookmark the permalink.